Texas’ unique geographic location, business-friendly regulatory environment, skilled workforce, and low-cost natural supplies have made it an economic powerhouse. With a tradition in research and innovation, Texas ranked second in the nation for patents issued in 2013. While being home to major tech companies such as AT&T, Texas Instruments, and BMC Software, the Lone Star state also represents one of the country’s most vibrant startup communities. The present article will discuss Texas’ most innovative industries and present the federal and state tax credits available to support ongoing R&D efforts. In May 2013, Texas passed House Bill 800, which created incentives to attract research and development investments to the state. Taxable entities engaged in qualified R&D activities can claim either a franchise tax credit based on qualified research expenses or a sales and use tax exemption on the purchase, lease, rental, storage, or use of depreciable tangible personal property directly used in qualified research. Effective January 1, 2014 and currently set to expire on December 31, 2026, the legislation encourages the creation of high-paying R&D jobs in Texas and provides an additional incentive for research conducted in partnership with Texas colleges and universities. Companies that contract with public or private institutions of higher education for the performance of qualified research are allowed an increased amount of franchise tax credit. The credit amount equals 5 percent of the difference between the qualified research expenses (QREs) incurred during the tax period and 50 percent of the average QREs incurred during the prior three tax periods, considered the “base amount”. When taxpayers contract with an institution of higher education in the state of Texas, the tax credit increases to 6.25 percent of the said difference. Texas has consistently outpaced the national economy and outperformed the nation in growth and employment. From 2001 to 2010, U.S. real GDP grew by 16.8 percent, while Texas’ real gross state product (GSP) increased by 23.5 percent. Texas’ unique geographic and demographic characteristics have boosted its economic performance and helped it overcome the recent recession. The state benefits from cheap and plentiful land, a border location that enables international immigration and trade, and abundant natural resources, such as oil and gas. For years, the state was dangerously dependent on its natural resources. More recently, however, even though the oil and gas industries continue to thrive, their overall share of the Texas economy is considerably smaller than it was in the 1970’s and 1980’s. In the aftermath of the oil-led recession of 1986, the Texas economy diversified away from the mining industry. 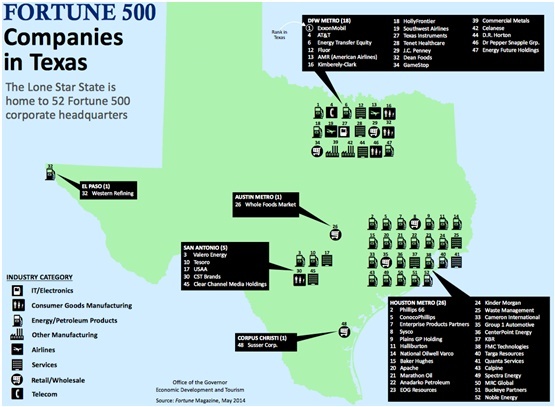 Now, the state’s diverse business community is home to 52 Fortune 500 companies and major players from a variety of sectors, such as information technology, aerospace, defense, biomedical research, agriculture, and manufacturing. Fast Company recently ranked Texas the second most innovative state in America due to its particularly high entrepreneurial activity. New businesses thrive on the state’s growing economy and contribute to the creation of jobs. According to Dice.com, a website that lists job openings in the technology and engineering fields, Texas is the country’s fastest-growing state for tech jobs. In the first semester of 2014, 8,100 new positions were created in a universe of 143,300 jobs. Most new opportunities are in the fields of mobile, big data, and software development. Innovation has played an important role in sustaining Texas’ outstanding economic performance. According to the National Science Foundation, the state ranks third in the nation for private R&D spending, with an annual spending of $12.9 billion a year. The investments go to a fairly diverse range of industries, from energy to biomedicine and microchip engineering. The following sections will provide an overview of the state’s major industries and their ongoing R&D efforts. The exploration of natural resources, particularly oil and gas, has played a major role in Texas’ economy. The first successful Eagle Ford well was drilled in 2008, while the country was going into severe economic recession. The Eagle Ford Shale covers all or portions of 25 Texas counties, equivalent to an area of approximately the size of West Virginia. Due largely to the rapid increase in Eagle Ford oil production, Texas’ crude oil output volume grew at an average annual rate of 28 percent between 2010 and 2014. 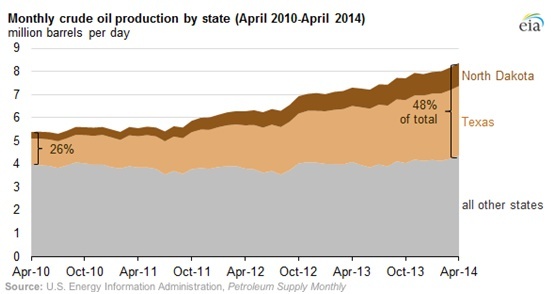 Natural gas production in the state almost tripled between 2007 and 2012. In 2013, Texas was responsible for about 30 percent of the nation’s oil and gas production. Texas’ wealth of natural resources goes hand-in-hand with the commitment to developing new and improved ways to explore them. Headquartered in Irving, Exxon Mobil, the nation’s largest oil and gas company, is constructing a 385-acre super campus in North Houston. One of the largest construction projects nationwide, the $1 billion, state-of-the-art campus will be home to a total of 10,000 employees. By incorporating the latest in technological innovations, the campus is designed to provide the workers with the tools and capabilities to accelerate the discovery of new resources, technologies, and products. The company is at the forefront of drilling innovation, particularly in remote, inaccessible locations. Its “extender reach technology” has enabled the development of long-reach wells that can extend horizontally for miles underground, giving access to previously unreachable resources. Exxon is also the creator of the fast drill process, “a physics-based process combining real-time digital analysis of the drilling system’s energy consumption with a structured approach to well planning and design.” This innovative process allows for an improved drilling rate and consequent reduction in fuel consumption, which decreases GHG emissions. The case of Exxon Mobile is just one example of the abundance of ongoing investments on Texas’ oil and gas industry. San Antonio-based Valero Energy recently announced a $370 million upgrade of its Houston refinery and Corpus Christi plant. Phillips 66, a now-independent oil refining company spun off ConocoPhillips, is currently building its 1.1 million-square-foot headquarter campus in Houston. The company also announced plans to dedicate $3 billion to refinery investments. Manufacturing is an important pillar of the Texas economy. The state’s dynamic and internationally competitive manufacturing sector is widely known for the world-class petroleum refining and chemical industries, however, it also comprises strong, advanced manufacturing activities, which include the production of computers, semiconductors, and motor vehicles. 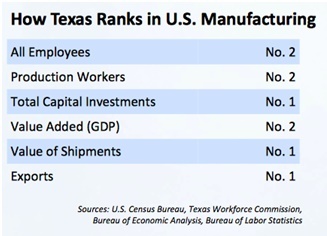 Texas is an icon of the U.S. manufacturing renaissance. The following 2013 data from the Texas Wide Open for Business Initiative substantiates the state’s unique position in the country. Between 2002 and 2012, Texas’ manufacturing output has grown from $97 billion to $211 billion, an increase of more than 118 percent. In 2012, Texas accounted for 18.6 percent of U.S. manufacturing exports, nearly double of number 2, California. The state’s strong business climate, skilled workforce, low-cost natural gas supplies, and low taxes increasingly attract manufacturers. Examples of relocations and expansion of activities are ever more common. Apple, for instance, is undertaking a $304 million expansion at its Austin campus, which will make the Texas capital one of the company’s largest bases of operation. Global manufacturer of steel pipe products Tenaris is building a $1.5 billion seamless tube manufacturing facility outside Bay City, which is expected to produce 600,000 tons of pipe annually. OCI Solar Power, a Korean solar component maker, recently opened the first N-Type cell manufacturing plant in the U.S. Located in San Antonio, the 240,000-square-foot facility will create 400 new jobs. N-Type cells are more efficient electricity conductors than regular P-Type solar cells, and will be made into 72 cell 320W modules. The San Antonio plant will be able to manufacture up to 50 modules an hour. In an effort to increase its performance plastics category, Dow Chemical recently broke ground on a new ethylene production facility in Freeport. This project is part of a $2.5 billion investment that have transformed the region into Dow's largest integrated manufacturing site in the globe and the largest chemical complex in North America, employing over 4,200 workers. The Information Technology (IT) sector is a huge and growing share of Texas’ economy. IT employment in the state exceeds 360,000 workers and the output of the IT services industry has increased by 26 percent between 2006 and 2011, from $17.1 billion to $21.4 billion. Texas is home to IT titans, such as AT&T, Dell, and BMC Software, as well as fast-growing mid-size IT companies and startups. The following illustration presents an overview of major IT companies with operations in the state. 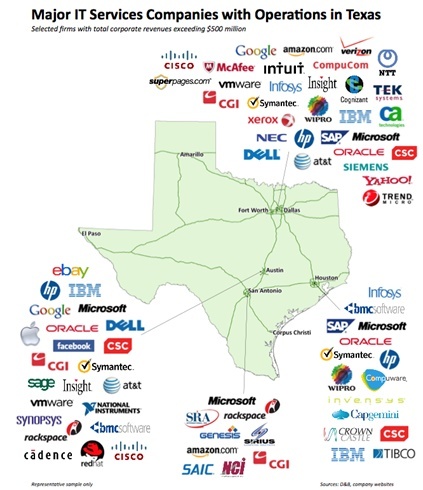 The Texan government has shown great support to IT companies. Since 2013, it has invested over $29.4 million in IT services startups and $3.6 million in IT university projects through the Texas Emerging Technology Fund. Since September 1, 2013, the state provides a sales and use tax exemption on equipment purchases for data centers of at least 100,000 square feet that invest $200 million over five years and create at least 20 full time permanent jobs paying 120 percent of the county’s average weekly salary. This favorable environment has translated into important IT-related R&D. Texas’ annual IT services-related patent output has surged by over 51 percent between 2002 and 2012, with a total of 17,820 patents issued. In 2012, Texas’ universities invested over $110 million in computer science R&D. Software development, which constitutes a strong candidate for federal R&D tax credits, is a particularly promising sector of Texas’ IT industry. Headquartered in Austin, National Instruments produces virtual instrumentation software. NI products are powerful, flexible technology solutions that accelerate productivity and drive rapid innovation. Common applications include data acquisition, instrument control, and machine vision. With over $1.1 billion in 2013 revenues, NI employs nearly 2,600 in Austin. The company provides innovative solutions for a wide variety of industries, including intuitive and productive design tools for robotics applications, from autonomous vehicles to mobile systems. The cutting-edge NI LabVIEW graphical programming language provides a high level of abstraction for sensor communication, obstacle avoidance, path planning, kinematics, and steering - all of which are key to robotics innovation. Texas is one of the most important locations for the U.S. aerospace and aviation industry. Home to the headquarters of two international airlines (American Airlines and Southwest Airlines) as well as two of the world’s busiest airports and NASA’s Johnson Space Center, Texas also hosts operations from 17 of the 20 largest aerospace manufacturers in the world, including Boeing, EADS, and Lockheed Martin. The output of the Texas aerospace manufacturing sector ranks second in the nation. In 2011, the state’s GDP for air transportation reached an all-time high of $8.4 billion. 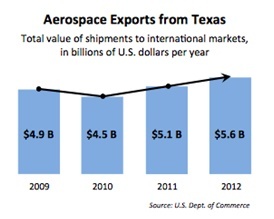 Texas’ aerospace exports totaled $5.6 billion in 2012, as shown in the accompanying chart. Aerospace activities in Texas include fighter plane and helicopter assembly, navigation instrument development, advanced space-flight research, military pilot training, and commercial space travel. According to a recent publication from the Texas Wide Open for Business Initiative, the aerospace and aviation industry employs over 153,000 workers at 1,300 firms. In the Dallas-Fort Worth metro area, the percentage of the workforce employed in aircraft manufacturing is nearly five times the national average. Texas leads the nation in skilled aerospace occupations - it has more aircraft mechanics and avionics technicians than any other state in the country. Four of the state's aerospace engineering schools made it to the nation's top 50 in 2013, including two in the top ten. Texas's universities are also committed to aerospace innovation. Together they have dedicated nearly $95 million to aerospace technology research between 2010 and 2012. In 2012, Texas ranked 4th in the nation for the number of new aerospace-related patents, which increased by 41 percent during the 2008-2012 period, compared to the previous five-year period. The Lone Star state is home to three important economic centers, Austin, Dallas, and Houston, figured in Forbes’ 2014 list of “America’s 20 Fastest Growing Cities”. According to the magazine, these cities illustrate the healthy labor markets, low unemployment rates, and business-friendly regulatory environment that contribute to the state’s outstanding economic performance. The nation’s 4th largest metro economy, Houston grew 5.2 percent in 2013, the fastest growth among the U.S. 50 largest metro areas. According to the Bureau of Economic Analysis, Houston’s gross domestic product (GDP) amounts to $517.4 billion, or 33.8 percent of Texas’ GDP. If it were a sovereign nation, the nine-county region known as the “Greater Houston” would rank as the world’s 25th largest economy, ahead of Norway and Belgium. Houston’s exports have grown by $34.4 billion since 2010 and account for nearly half of Texas’ export growth over that period. Many of the 375,000 jobs Houston added between December 2009 and December 2013 were in sectors such as oil exploration, oil field services, and oil field equipment manufacturing, in which the value added per worker is considerably high. The boom in the Texas shale plays has triggered a boom in chemical plant construction in the region, with some estimates placing the aggregate value as high as $70 billion. Considered by many as the “Energy Capital of the World”, Houston is home to more than 5,000 energy-related firms. The share of Houston’s economy directly tied to energy – and this includes mining, chemicals, refining, oil field equipment manufacturing, fabricated metal products, pipeline transportation, and engineering services - exceeds $186.6 billion, or 38.1 percent of the regional GDP. According to the Texas Workforce Commission, the Houston metro area led the state in employment growth, creating 107,400 jobs between August 2013 and August 2014. The three fastest growing sectors were 1) building construction (14.3 percent annual growth, 7,100 jobs); 2) engineering (13.3 percent annual growth, 9,300 jobs); and 3) oil field services (11.2 percent, 5,400 jobs). Houston is also home to the Texas Medical Center, the largest medical center in the world, responsible for a local economic impact of $10 billion. With more than 52,000 employees, its facilities encompass 21 million square feet. Altogether, 4.8 million patients visit them each year. Houston boasts more than 40 colleges, universities, and institutions, offering a wide variety of higher education options. The region has also attracted important investments in R&D. Exxon Mobil and BP have recently relocated R&D teams to the area. In March, Dow Chemical Co. announced plans to build a massive research center in Lake Jackson (located within the Houston–Sugar Land–Baytown metropolitan area) with lab and office space for more than 2,000 employees. On September 20, the leading global integrated energy and chemicals company Saudi Aramco opened its largest U.S research facility in Houston. The center will focus on upstream research and technology development, including disciplines such as production management, drilling, reservoir engineering, geology, geophysics, and advances related to subsurface sensing and control. The 60,000-square-foot center will create 100 high-tech, scientific, and research jobs. The Dallas-Fort Worth (DFW) Metropolitan Area is the country’s 6th largest metro economy, with a GDP of $447.5 billion in 2013. 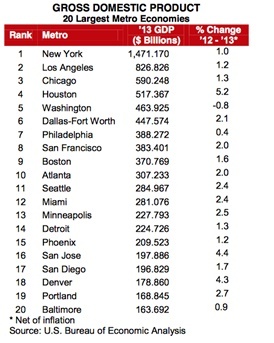 It is also the 4th most populous metro area in the nation. A recent study predicts that, by 2015, the DFW economy will grow to $464.7 billion and by 2016 it should rise to $491.4 billion. Home to the second largest airport in the U.S. and the third busiest one in the world, the region is a hub for travel and business. Globally connected and centrally located, Dallas is a major mid-continent gateway to the world, offering nonstop access to 187 cities. With quick access to rail, air, and over-the-ground truck transportation, the region is often associated with major logistics, distribution, and supply chain operations. Irving-based energy giant Exxon Mobil Corp, with annual revenue in 2013 of $390.2 billion. AT&T Inc. with $128.8 billion in revenue. Energy Transfer Equity, one of the largest pipeline companies in the U.S. and owner of some 70,000 miles of pipeline with operations in Texas, Oklahoma, and all the way to the California border and into the Great Lakes. Fluor Corporation, a multinational engineering and construction company whose annual revenue in 2013 reached $27.35 billion. Kimberly-Clark Corporation, consumer care company and manufacturer of paper-based consumer products with annual revenue of $21.15 billion in 2013. Semiconductor manufacturer Texas Instruments Inc., with $12.2 billion of revenue in 2013. Technological industries play an important role in Dallas’ economy. According to the Greater Dallas Chamber of Commerce, the DFW Metroplex holds about 37.5 percent of the state's high-tech workers, which correspond to nearly as many jobs as Houston and Austin combined (26 and 13.2 percent, respectively). Dallas and Fort Worth’s northern suburbs are often referred to as the “Silicon Prairie”, due to the high concentration of semiconductor manufacturers, telecommunications, and other information technology companies. The area includes the “Telecom Corridor” in Richardson, named after the proliferation of telecommunications companies, such as AT&T, Fujitsu, Cisco Systems, Verizon, Samsung Mobile, and MetroPCS. DFW is also among the nation’s top regions for aviation and aerospace activities, which constitute a key source of economic strength. With more than 900 companies in North Texas, the aerospace industry accounts for one in every six jobs in the area. Lockheed Martin Corporation and Bell Helicopter Textron are the largest aerospace employers in DFW, with more than 26,400 employees. There are 25 colleges and universities in DFW. Launched on May 1st 2014, the Texas Research Alliance (TRA) helps business and government take advantage of the research expertise found in these institutions. According to the Dallas Chamber, companies in the North Texas spend on average $4 billion on research per year. However, only a small percentage of it goes to local universities. The TRA aims to bridge this gap and foster innovation through cooperation. Within five to seven years the Alliance expects to generate $10 million or more in direct research grants annually for its partner universities. DFW is also home to a growing startup community. The Dallas Entrepreneur Center and Launch DFW are just two examples of organizations dedicated to supporting and facilitating entrepreneurship in the area. In 2014, Austin took the top spot on Forbes’ list of “America’s 20 Fastest Growing Cities” for the fourth year in a row. Spurred by annual population growth of 3.0 percent and a favorable business climate, the Lone Star state’s capital is widely considered an economic powerhouse. Austin is home to the 51,000-student University of Texas at Austin, which accounts for a unique pool of highly educated workforce, and to mega corporations as diverse as Dell and Whole Foods. A major center for high technology, Austin was dubbed “Silicon Hills”. According to the Austin Chamber, the region boasts 306 high tech manufacturing firms, which have grown by 7.4 percent since 2009, employing over 29,700 people. High tech manufacturing currently represents about 58.3 percent of the region’s manufacturing employment. Major companies with operations in the Austin-Round Rock-San Marcos area include Dell, IBM, Apple, Hewlett-Packard, Qualcomm, Inc., Intel Corporation, Oracle, the Samsung Group (largest semiconductor production center outside of Korea), Flextronics, among many others. Austin is among the most international economies in the nation. The large amount of international trade is partially explained by the city’s role as high-value goods producer and national electronics center. In 2010, of the total $93.5 billion in goods trade involving Austin, $46.3 billion were in electronics. The region’s central time zone with a low risk for natural disasters, abundant telecom, and low electric rates has attracted key players in the data center industry. Data management companies, such as Bazaarvoice, InfoChimps, Sotera Defense Solutions, and Tableau Software, have also thrived on the combination of skilled talent, secure data storage, and reliable, cost-effective infrastructure and utilities available in Austin. On October 13, AT&T completed the upgrading of its fiber network in Austin to 1-gigabit-per-second speeds. Google’s Fiber is currently under construction and expected to be available in the near future. The role of ultra high-speed internet in creating new startup hubs is unmistakable. Austin is among the first areas in the nation to take advantage of the emergence of a supportive, fiber-based business environment. Austin has been called a hotbed for innovation and business creation. According to a Brookings Institute report the region ranked 9th in per capita patent activity in 2013, with an average of 2,500 patents per year. The University of Texas consistently ranks among the top research universities in the country with over $1.1 billion in sponsored research over the past two years. Austin’s culture of innovation has made it a premier destination for creative and digital media technology. This emerging industry encompasses games, software, and mobile application development, music and film technology, education technology, advertising, social media, and digital content. It is estimated that 40,000 people work within the creative and digital media technology industry throughout the Austin metro area. The region is also home to internationally renowned events such as the SXSW Music, Film, and Interactive conference, which has been a platform for the launching of innovative products, such as Twitter in 2007 and Foursquare in 2009. When it comes to clean energy, Austin is also an example of innovation. It has over 200 clean technology companies that employ 20,000 people. These include industry-leading wind turbine and photovoltaic manufacturers, such as TECO-Westinghouse Motor Co. and SunPower. Austin is also home to important programs that stimulate the development of sustainable solutions. Headquartered at the University of Texas at Austin, Pecan Street Inc. is a research and development organization focused on developing and testing advanced technology, business model, and customer behavior surrounding advanced energy management systems. The organization’s flagship effort is the Pecan Street Demonstration, a smart grid research project that began in Austin’s Mueller community and has since expanded across Texas and into California and Colorado. Texas is home to some of the nation’s most renowned universities. These institutions are engaged in cutting-edge research that promises to benefit society in numerous ways. The follow sections present an overview of the ongoing R&D efforts of four Texan universities. I. Rice University: Located in Houston, the William Marsh Rice University was established in 1912. It has consistently ranked among the top 20 universities in the U.S. and the top 100 in the world. Given its size, Rice has a considerably high level of research activity, with approximately $94 million in annual research expenditures during the academic year 2012-13. Most notable research efforts concentrate on the field of applied science; programs include artificial heart research, structural chemical analysis, signal processing, space science, and nanotechnology. Recent advances include the use of mobile sensing technologies for the generation of biomedical “big data”; the development of new strategies for weakening cancer, which include alternating cycles of radiation or chemotherapy with immune-boosting treatments; and the development of the nanoribbon film, a de-icing film that allows radio frequencies to pass. Rice’s dynamic and fruitful relationship with the business world has been recognized all over the globe. The incubator, “Rice Alliance for Technology and Entrepreneurship”, was ranked 1st in the world by the Stockholm-based UBI Index both for 2013 and 2014. Since its inception in 2000, the Rice Alliance has assisted in the launch of more than 311 new technology companies, which have raised more than $1.3 billion in early-stage funding. Three new companies born at Rice University have won recognition in this year’s Goradia Innovation Prize competition run by the Houston Technology Center (HTC). NanoLinea, a startup company spun out of the research lab of Rice Chemical Engineering, won the grand prize. The company is creating a minimally invasive therapeutic implant treatment for cardiac ventricular arrhythmia based on carbon nanotube fibers. II. University of Texas: One of the nation’s largest systems of higher education, the University of Texas System is composed of nine universities and six health institutions that educate more than 213,000 students. Every year, UT’s academic institutions award more than one-third of all undergraduate degrees in Texas, and its health institutions grant two-thirds of all health professional degrees. The University of Texas at Austin is the flagship institution of the UT System and one of the largest public universities in the U.S. Founded in 1883, it has the fifth-largest single-campus enrollment in the country, with more than 50,000 students. UT Austin is also one of the world's leading research universities. Its faculty and research staff generated more than $628 million in federal and corporate funding last year. This research funding and the graduate students it attracts help contribute about $2.8 billion and 16,000 jobs annually to the Texas economy. UT Austin is committed to helping move groundbreaking discoveries from the lab to the marketplace. The Austin Technology Incubator has graduated 65 companies that have generated $1.2 billion in revenue and created 2,850 jobs in central Texas. The Office of Technology Commercialization protects, markets, and licenses the university’s inventions and software; while the Office of Industry Engagement promotes collaborative research between university researchers and their industry sponsors. During the 2011-12 fiscal year alone, UT’s Office of Technology Commercialization processed more than 160 invention disclosures and more than 200 patent applications and helped secure 41 U.S. and 39 foreign patents. III. Baylor University: Located in Waco, Baylor is a private Baptist university and the oldest continuously operating university in Texas. It offers 144 undergraduate degree programs, 74 master’s programs, and 34 doctoral programs for over 16,200 students. With more than 20 research centers and institutes and many additional respected department-based faculty researchers, Baylor was designated as a Carnegie Foundation University with "high research activity" and ranked among the "most productive" research universities in America by Academics Analytics. With leading-edge facilities, Baylor is home to over 150 teaching and research labs. With over 300,000 square feet of space for labs, research centers, workforce training, and academic collaboration, Baylor Research and Innovation Collaborative (BRIC) pairs university initiatives with industry partners to foster creativity and ignite discoveries with real-time, real-world applications. BRIC’s focus areas include 1) electrical engineering research – such as the creation of highly efficient energy conversion technologies and energy renewal conversion systems for smart-grid electrical power distribution systems; 2) composite materials research; 3) air science – including research in space weather observation, analysis and forecasting of human factors affecting aircraft design, and advanced avionics; and 4) quantum optics – with particular focus on quantum laser spectroscopy, photonic quantum heat engines, and quantum coherence enhancement of photovoltaics and surface plasmon lasers (spasers). Examples of innovation at Baylor are numerous. Researchers are pioneering techniques to measure pollutants in the icy currents of the Arctic Circle using the earwax of the 100-ton bowhead whale. They are also developing revolutionary methods for the early detection of retinoblastoma using flash photography, and for the noninvasive identification of cancer biomarkers in human breath and saliva. IV. Texas A&M University: The Texas A&M University System is a statewide network of 11 universities, seven state agencies, two service units, and a comprehensive health science center. Altogether, the system educates more than 131,000 students and reaches another 22 million people through service each year. Located in College Station, Texas A&M University is the flagship institution of the Texas A&M University System. It is the sixth-largest university in the country and home to more than 58,000 students. The university was named second in the nation by The Wall Street Journal among all universities, public and private, in a survey of top U.S. corporations, non-profits, and government agencies, based on graduates that recruiters prefer to hire. Texas A&M research expenditures for 2013 reached $820 million, often translating into patents and licenses with significant, far-reaching economic benefits. Researchers and graduate students are involved in projects on every continent in the world, with more than 600 initiatives underway in more than 80 countries. A&M’s 400-acre Research Park includes 10 diversified facilities and more than 500,000 square feet of space for innovative companies and organizations focused on transferring new technologies into the marketplace. Examples of recent advancements include the development of a novel DNA sequencing technique capable of unlocking a non-coding section of the human genome called heterochromatin. Previously thought by scientists to have no discernible function at all, this mysterious “junk DNA” can actually offer a treasure trove of insight into complex genetic-related diseases such as cancer and diabetes. In the field of agriculture, Texas A&M AgriLife Research was ranked first in agricultural sciences expenditures for fiscal year 2012, the latest year for which figures are available, according to the National Science Foundation. The agency accounted over $176.4 million of the nearly $3.3 billion spent on agricultural research by more than 30 U.S. universities. The university is also engaged in the promising field of robotics research. A research team from the Texas A&M Bipedal Engineering Robotics (AMBER) Lab was responsible for the algorithms used by NASA in the advanced humanoid robot Valkyrie to enable its locomotion, mobility, and full-body coordination. Innovation has transformed Texas from an oil-dependent state into a strong, diversified economy. The outstanding performance of Texas’ oil and gas industry is now accompanied by equally remarkable manufacturing, aerospace, and IT activities, not to mention the state’s unique role in the national logistics sector. Federal and state tax incentives are available to support the innovative efforts of the many companies that make Texas an economic dynamo.